We made this lions head hand carved door for a family in Bucharest, Romania. They wanted wanted to replace their front and back doors with a unique work of art. 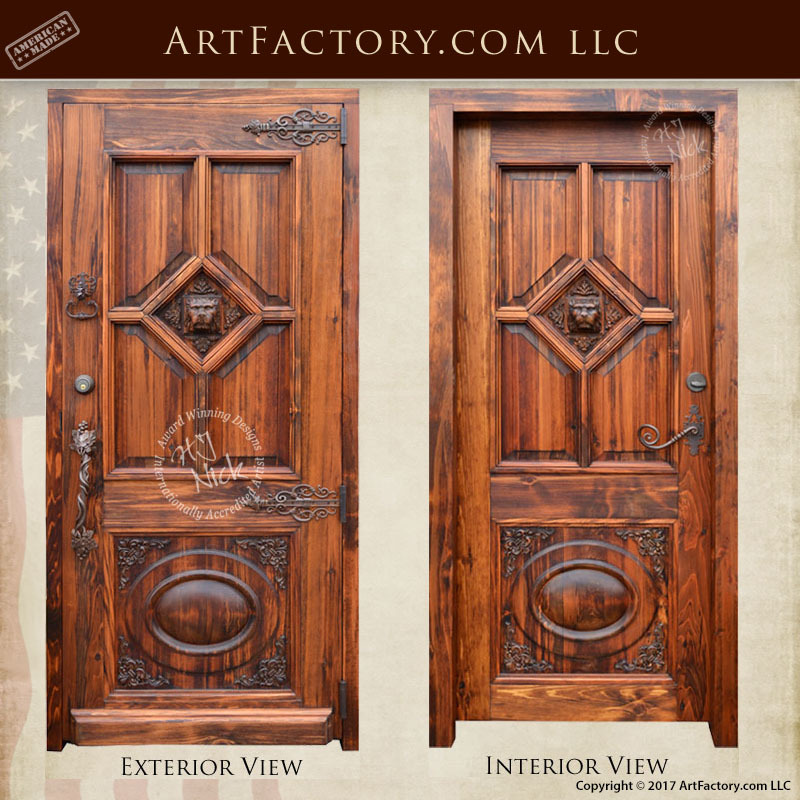 Even though we are half a world away in America, this customer chose ArtFactory.com to create the perfect handcrafted, fine art doors for their home. Specifically, they wanted a lions head themed door that would stand out and fit in with their surrounding area. Furthermore, our master artists created this door design based on classic Romanian architecture, and built it in original hand and craft. Our blacksmiths hand forge the wrought iron accents, including the decorative hinge straps on the exterior side of the door. Also with the door knocker and twisted grape vine motif to further enhance the Euro style. These designs give the custom door an elegance that a city once known as, "Little Paris" deserves. Our custom hardware is heated to 1000 degrees, anvil hammered, and hand patina finished which guarantees your door hardware to never corrode. In addition this custom made door also can be made with an arch, see 251HCA. The lions head hand carved door is an original design by H.J Nick that has been certified to fine art investment quality with future antiquity value.